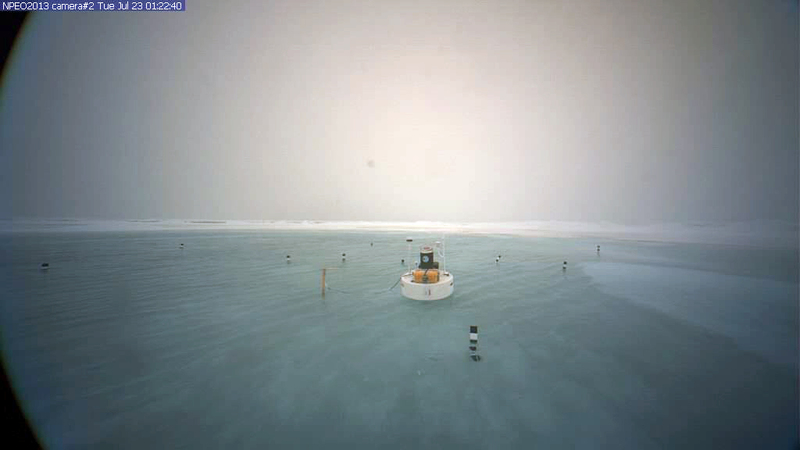 The Live Cam sits on an ice flow that has drifted away from its starting point at the North Pole, and it is now near the 85 degrees meridian. And the water is in fact a large lake, or melt pond, that has formed on the sea-ice. Every summer the sea-ice melts and retreats, so what the image shows is not an unusual event. However, James Overland, a researcher at the National Oceanic and Atmospheric Administration, told Climate Central that the melt pond does seem unusually large compared to what is typically observed in a melt season, though. “We have extensive melt ponds every year, but I do not remember such an extensive lake in previous years. The lake is more a product of how the ice was configured earlier in the year,” he said. And the bigger story is that this northern summer, the sea-ice big melt is tracking just above the melt trajectory in 2012, which created a new record for sea-ice melt. New records were set for snow extent, sea ice extent and ice sheet surface melting in 2012, with record high permafrost temperatures, and the duration of melting was the longest observed yet on the Greenland ice sheet. And in this year the record-breaking and jaw-dropping stories continue at an alarming rate. Greenland. This image is from the US National snow and Ice Date Centre and shows melting on Greenland for 26 July 2013, with melt area exceeding 40% of the surface area. This follows a record-breaking melt year in 2012, when in July NASA released findings showing surface melt of the Greenland ice sheet of more than 97 per cent over a few days, a rate unprecedented in the era of satellite observation. 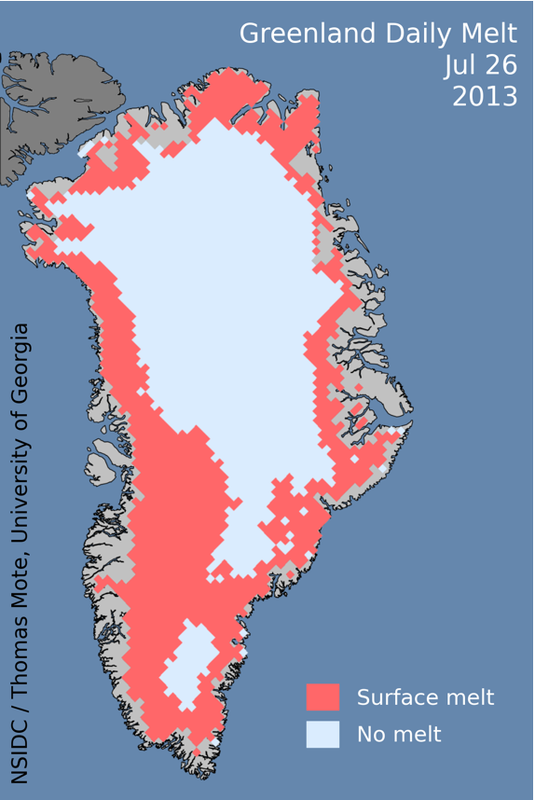 And in late July 2012, the reflectivity of the Greenland ice sheet, particularly at the high elevations that were involved in the mid-July melt event, had declined to record lows. This indicated that the ice sheet was absorbing more incoming solar energy than normal, potentially leading to 2012 being another record melt year in a long-standing trend of increasingly higher melt seasons. 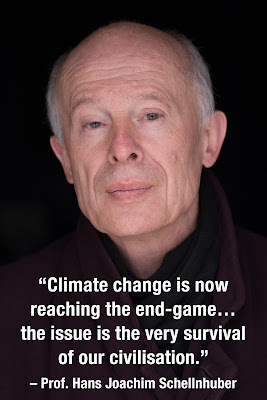 His comments match with research by Robinson et al in 2012 that revised the tipping point for Greenland down to 1.6ºC (uncertainty range of 0.8-3.2ºC) above pre-industrial, just as regional temperatures are increasing up to three-to-four times faster than the global average, and the increased heat trapped in the Arctic by the loss of reflective sea-ice ensures an acceleration in Greenland melt rate. In other words, IF the lower boundary apply – at the current temperature rise of 0.8C – then we have already reached Greenland's tipping point. And with temperature rises in the pipeline (and global emissions still rising, no reasonable agreement to reduce them), we are very likely to hit best estimate of 1.6C with a decade or two at most. And just published, new iceberg research points to areas at risk of rapid disintegration and quicker sea level rise. It finds that stretches of ice on the coasts of Antarctica and Greenland are at risk of rapidly cracking apart and falling into the ocean, exacerbating sea level rise over the coming decades. Record heat: The Siberian Times reports that recent days have seen Siberia's nickel capital hotter than Nice and on a par with Naples: "Norilsk – above the Arctic Circle – is known as one of the world's coldest cites, and is built on permafrost. Norilsk has hit 32C in recent days with some forecasts predicting a blistering 35C by the weekend as the Arctic competes with the Mediterranean. The tundra turned hot as the Kransnoyarsk region industrial city – where foreigners are restricted from visiting – smashed records for heat established in 1979. The average temperature in July is 13.6 but the mercury was touching 32C, a long way from the coldest-ever recorded temperature of minus 61C. The previous hottest was 31.9C, more than three decades ago." This follows a June heatwave which led numerous cities in Alaska to record their all-time hottest temperatures on record. Rapid acidification: The BBC reports that Arctic seas are being made rapidly more acidic by carbon dioxide emissions, according to scientists from the Arctic Monitoring and Assessment Programme. They say even if CO2 emissions stopped now, it would take tens of thousands of years for Arctic Ocean chemistry to revert to pre-industrial levels. Oceans are more acidic than they have been for at least 20 million years, and they are acidifying 10 times faster today than 55 million years ago when a mass extinction of marine species occurred. Previously it has been predicted 10% of the Arctic Ocean will be corrosively acidic by 2018, and 50% by 2050. Boreal forests: A new study, "Recent burning of boreal forests exceeds fire regime limits of the past 10,000 years", finds that the region’s mighty boreal forests — stands of mighty spruce, fir, and larch trees that serve as the gateway to the Arctic Circle — have been burning at an unprecedented rate during the past few decades. The study, published Monday in the Proceedings of the National Academy of Sciences, found that the boreal forests have not burned at today’s high rates for at least the past 10,000 years, and climate change projections show even more wildfire activity may be to come. The study links the increase in fire activity to increased temperatures and drier conditions in the region, which is driving wholescale changes in the massive forests that encircle the northern portion of the globe. 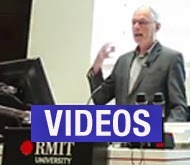 Our work is based on a prediction of the magnitude and timing of methane emissions from the thawing of Arctic offshore permafrost by a scientist who has done extensive field work on this part of the ocean bed and is a globally recognized expert. We calculated the financial implications of these emissions for the world economy over a century and also considered the effect of the emissions on increasing overall global warming, obtaining a 0.6C figure by 2040. We rightly consider these to be substantial figures, which deserve wide circulation among climate scientists, and Nature and its referees agreed with us. The mechanism which is causing the observed mass of rising methane plumes in the East Siberian Sea is itself unprecedented and the scientists who dismissed the idea of extensive methane release in earlier research were simply not aware of the new mechanism that is causing it. What is happening is that the summer sea ice now retreats so far, and for so long each summer, that there is a substantial ice-free season over the Siberian shelf, sufficient for solar irradiance to warm the surface water by a significant amount – up to 7C according to satellite data. That warming extends the 50 metres or so to the seabed because we are dealing with only a polar surface water layer here (over the shelves the Arctic Ocean structure is one-layer rather than three layers) and the surface warming is mixed down by wave-induced mixing because the extensive open water permits large fetches. So long as some ice persisted on the shelf, the water mass was held to about 0C in summer because any further heat content in the water column was used for melting the ice underside. 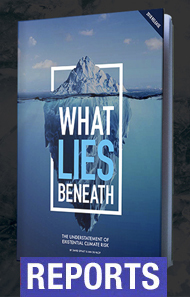 But once the ice disappears, as it has done, the temperature of the water can rise significantly, and the heat content reaching the seabed can melt the frozen sediments at a rate that was never before possible. And that is one of a number of dire warnings from the Arctic we ignore at out peril .